1.Prepare Crab Cakes: In medium bowl, whisk egg; stir in mayonnaise, mustard, sriracha, lemon juice, seafood seasoning and black pepper until well combined. Fold in 3 tablespoons onions and capers; gently fold in crabmeat and 1-1/4 cups breadcrumbs, being careful not to break up the crabmeat. Let stand 10 minutes. 2.Line cookie sheet with plastic wrap; place remaining 3/4 cup breadcrumbs in shallow dish. Form crabmeat mixture into 12 (2-1/2-inch) cakes and lightly coat with breadcrumbs. Place on prepared cookie sheet; cover and refrigerate 45 minutes. 3.In large nonstick skillet, heat oil over medium heat. In batches, cook crab cakes 5 minutes or until golden brown, turning once. 4.Prepare Spicy Tomato Salsa: In food processor with knife blade attached or blender, pulse salsa, clam juice, chipotle peppers, vinegar and red pepper until combined. 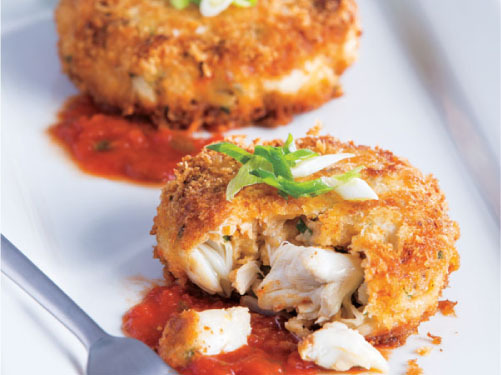 5.Serve crab cakes warm garnished with remaining onions and salsa.